July 27 2018 - Nothing tests a global organisation's ability to communicate quickly and clearly with stakeholders like a crisis - a data breach, a leadership scandal, a terror attack, a natural disaster or even a major political event like Brexit. How companies deal with crisis events impacts everything from revenue to customer satisfaction and even stock price and in a time when 'black swan' events have almost become a regular part of business and political life, Global 2000 organisations are putting crisis management technologies at the very top of their technology investment lists. Amidst all of the recent uncertainty, video is quickly emerging as a powerful corporate communication medium. Not only is video a personal, authentic and emotive way to communicate, it is also accessible from almost any device stakeholders use to consume content. Forward-thinking organisations understand that video accounts for three-quarters of online traffic and are now leveraging their enterprise video platforms as go-to systems for distributing information and connecting executives with company stakeholders in crisis situations. Most crisis communications are centered around mass email, corporate blogs, press releases, conference calls and general word of mouth. These modes of communicating during a crisis will never disappear, but as primary methods each offers an inflexible, impersonal and delayed communication channel that simply cannot adapt to the chaotic and rapidly-moving environment a crisis can create. And even when no crisis is imminent, in large organisations senior executives rarely have direct contact with the wider workforce. The name of the CEO may be well known, but the practical opportunities for face time in a dispersed enterprise encompassing thousands of employees across multiple locations are limited. As executives attempt to ensure that everyone in the company is clear and up-to-date on company vision, culture and direction, traditional communication channels are creating a lack of overall employee engagement. Decades of psychological and ethnographic research have found that visuals are processed at hyper-speed by the brain. In fact, one researcher has estimated that watching one minute of video is the equivalent of hearing 1.8 million words. When information is fluid, not only does video allow the provision of real-time information, but it also offers both control over messaging and information security: two things that traditional crisis communication methods cannot match. A short, real-time video can be created quickly and shared with everyone, or only with people who have the necessary security permissions - and at a higher level of impact, understanding and retention. Enterprise video also offers senior management a simple way to engage with everyone within the company, enabling employees to see and hear directly from them versus their representatives, through either live events or on-demand video messages. In addition, video offers a more personalised way of demonstrating leadership and conveying a message, which result in increased employee engagement. For a global organisation, distributing effective company-wide communication is a challenge, even under normal circumstances. But in a crisis, lack of timely information and credible detail can fuel misconception and allow rumours and mis-information to quickly take the place of facts. What if executive teams could quickly produce brief videos that succinctly explain the facts surrounding a crisis, give staff immediate instructions on what to do, and explain the company's strategy for mitigating impact of the crisis? In preparation for the UK's EU referendum in 2016, while a French bank produced a PDF document, a large global bank shot two different videos to explain what a Brexit vote would mean for the bank and its customers in both the In and Out scenarios, creating a readiness for questions and concerns regardless of the vote. Another example of video's effectiveness as a crisis communications tool occurred at a large UK bank, which used video to limit reputational damage caused by a failure to pass the Bank of England's 'stress test' for exposure to risky assets in 2016. The bank needed effective internal communication to reassure employees, and effective external communication powerful enough to reassure investors. Video messages were distributed to the general public via the national press. The purpose of the video messages was to manage public expectations, particularly with regard to a Government bail-out. The video content was used as B-roll by many outlets, which kept inbound calls and panic over the bank's status to a minimum. The CEO also spoke to the bank's internal audience of employees via video, striking a personal tone and focusing on how important and valuable staff would be to the bank's eventual emergence from the crisis. In addition, the hosted videos messages also delivered crucial data on how many people were watching and listening to the news. In order for video to become a natural part of crisis communication, enterprise video platforms must integrate seamlessly with the communication infrastructures already in place - systems like Skype for Business, SharePoint, IBM Connections and Oracle WebSphere. And given the reputational sensitivities, it is essential that video communication also be secure. The capability to restrict viewing to specific groups or individuals should be available. Video should also be deliverable both inside and outside the firewall and feature on-premise and cloud capabilities for availability anywhere, anytime and on any device. Secondarily, enterprise video technology must also be sophisticated enough to allow videos to be auto-deleted after viewing, eliminating worries that anyone is viewing an out-of-date version or sharing inappropriately. Viewership should also be tracked, so communications managers can see who is up-to-date and who still needs to be informed. It wasn't long ago that creating high quality video for internal and external use required expensive cameras, state-of-the-art audio hardware, dedicated video rooms and a small staff of experts who knew how to use it all. That said, today's enterprise video platforms are both easy to use and work seamlessly with existing technology infrastructure - not only the dedicated video rooms that still exist among many Global 2000 firms, but also the built-in audio and video technology found in today's laptops, tablets, desktop computers and mobile phones. More than any other method of corporate communication, crisis communications require a level of credibility and engagement that can only come with organically produced videos. Although the perception is that corporate video is difficult to capture and stream, the reality is nearly anyone in the organisation can produce and distribute high-value video assets with the right enterprise platform in place. At this point in the progression of enterprise video, the increased engagement video provides over communication methods like email, teleconferencing and instant messaging is above debate. But what still needs to be understood and considered by executives is that an enterprise video platform can enable live, scalable, two-way communication between them and their globally distributed employee and customer bases - tens of thousands of concurrent users at one time - with no loss of performance or broadcast quality. In addition, the right enterprise video platform will be able to deliver live or on demand video assets to any device, regardless of configuration or operating system, without negatively impacting network infrastructure performance. Which, of course, is the primary component any global organisation requires if they are attempting to create a true digital workplace. Video is now an expected communication channel in day to day life, as well as within the true digital workplace. Whether for entertainment, information or staying connected, most of us watch multiple videos per day on multiple devices. Businesses are capitalising on this shift by using video as a practical and reliable tool in corporate communications. When a crisis lands, video has an immediacy and emotional power that makes it easier to disseminate facts, messages and information quickly to employees and stakeholders. In crisis situations, video also has the power to compel decision-makers to convey information in the form of a story - where according to psychologist Jerome Bruner, it is 20 times more likely to be remembered. The fact is, people are engaged by video in a way that is simply not possible with voice, text or still images. The first step toward acceptance within enterprises is to incorporate video into regular communications patterns. Only then will video communication become an effective way to disseminate information and engage stakeholders when a crisis lands. 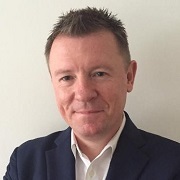 Paul Herdman: Paul joined Qumu in 2015, bringing 20 years of experience in senior sales positions, primarily within the software industry, including vice president EMEA at a UK based Risk Management start up and enterprise sales at Oracle and Stellent.